From the beautiful Frangipani to Worry Vines, this tropical garden is well worth a visit. 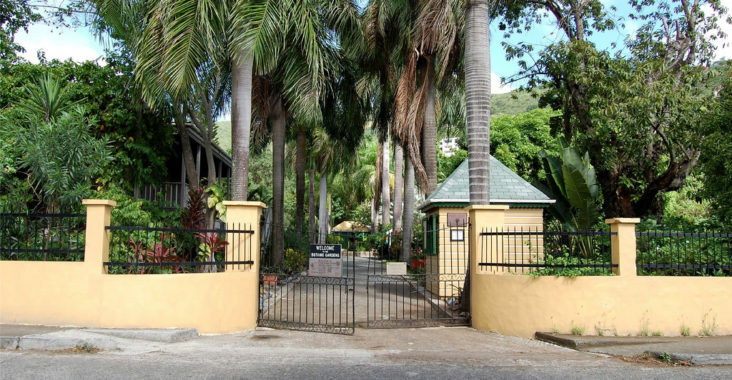 The Joeseph R.O’Neal Botanic Garden is located in Roadtown, Tortola. 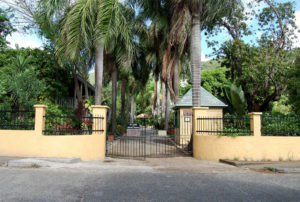 The garden is filled with tropical blooms of Hibiscus, Ixora,Jasmine,Bouganvillaea, Frangipani, Lling Llang and many more along with tropical fruit trees such as mango,breadfruit and papaya. As you pass under a pergola covered in blooms of purple wreath, you come to a small lily pond with turtles and sometimes glimpses of a red tortoise couple in residence. Beyond the pond, the walkways lead to collections of orchids, palms, cactus and on to an immense Banyan tree surrounded by ferns,heliconias (Bird of Paradise), bromiliads, gingers and ferns. There is a small medicinal plant garden in the front left area of the garden with a few plants like the “worry vine”(used locally for digestion) but many of the tropical plants are used medicinally like the Morinda citrifolia (Noni)and the Moringa oleifera (Tree of Life) and the local names are indeed worth learning if you are lucky enough to spend time with an “elder” in the community! If you ever visit this lush tropical island of Tortola, be sure to study the bountiful , beautiful plants besides just the bananas. papayas and mangos ! !